By bringing out the signature refreshing taste and sweetness of Sokujo, the representative Sake production method of modern times, this Sake attains a flavor that is next to none when compared even with high-quality white wines. This is FISHERMAN SOKUJO. The rock crab logo, one member of the blue crab, popular in countries around the world, and the vivid, deep red of the bottle symbolize the quality of the Sake. This Sake matches well with general seafood dishes, but pairing it with shrimp or crab, foods with high levels of savory flavor, maximizes its true worth. 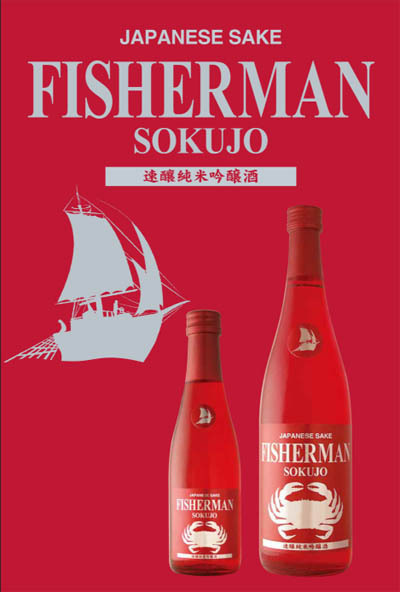 The feel of drinking FISHERMAN SOKUJO, with its fruity flavor and light sweetness, would have you believe you are drinking a top level white wine. It shows off the new potential of expert rice and malt fermentation methods used in Japanese Sake to create any kind of flavor.